Everyone wants to own a little bit of TV history. At least we like to thing that is the case. This is why action figures and other memorabilia from the more popular TV shows is so popular among collectors today. For classic car collectors nothing is a better find than discovering a car that was used on a TV show. And for those not so lucky, they make their own clone versions of the 1969 Dodge Charger from The Dukes of Hazzard (1979), the modified 1982 Trans Am from Knight Rider (1982), the 1974-1978 Firebird Esprit from the The Rockford Files (1974), and the 1974 Gran Torino from Starsky and Hutch (1975). And for the those who have gotten their hands on one of the original Chargers used in The Dukes of Hazzard or a Firebird Esprit from the Rockford Files, they weren’t one of kind cars – these shows went through many Chargers and Firebirds since they were always doing stunts which would necessitate a constant flow of replacements. Now how would you like to own a vehicle used on one of the most popular and critically acclaimed TV shows ever made? Now if I were to tell you that only two were used during several seasons of episodes. I bet that peaks your interest. You may be thinking this would have to be an exotic sports car or a muscle car. How wrong you would be, it would be a SUV – a 1999 Chevrolet Suburban. 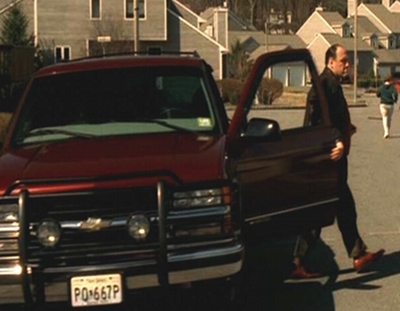 This wasn’t just a run-of-the-mill 1999 Chevrolet Suburban, it was driven by no other than Tony Soprano, the lead character in HBO’s hit TV series The Sopranos (1999). Many viewers who watched The Sopranos when the first season premiered were probably shocked when Tony Soprano, one of the top dogs (he wan’t official boss yet) in his northern New Jersey crime family, was driving a full-size Chevrolet SUV and not the typical American luxury car like a Cadillac or a Lincoln which most viewers have become accustomed to in Mafia films or past Mafia TV mini-series. Where The Sopranos was different was it was the first time a TV show was based on the day-to-day life of an American mobster. However David Chase, The Sopranos’ creator and producer, upon close inspection of the TV series, was a stickler for details. Everything from the genuine North Jersey (on location) sets to the dress and speech patterns provided the viewing audience with a more real world portrayal of a rising mob boss. Chase happened to be a writer on the Rockford Files which popularized the 1970s Firebird bringing a 1974-1978 Firebird Esprit into America’s home every week for several seasons. So Chase by making the Suburban Tony’s main mode of transportation, helped viewers to strengthen knowledge of Tony’s overall persona. Tony was a guy who stood a tall 6 foot 1/2 inches and was around 220 lbs at the beginning of the series – in other words he wasn’t a small guy. The Suburban is a favorite among those over 6 feet tall and weighing over 200 lbs, with its big comfortable seats, amazing leg room, and headroom as spacious as an airplane hanger. And as the series progressed Tony would pack on another 10 to 15 lbs for each successive season, putting Tony at around 290 lbs by the time of the series finale. The Suburban which would hang around for four full seasons, would still provide all the comfort and room to accommodate Tony’s growing girth. By the second season everyone had grown accustomed to seeing Tony driving his big Suburban around north Jersey (especially since it was in the opening credits for every single episode for every season. Though the Suburban had pedestrian connotations, it was outfitted with the upscale "LT" trim package and with just about every option the 1999 option list offered. 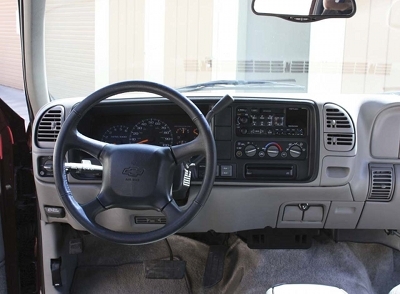 This list included – the full-time Autotrac four-wheel drive system, leather seats, CD & cassette player, and just about every power option you could imagine. Tony’s Suburban was the 1500 series which was standard with the gasoline powered 5.7 liter V8 producing 255 horsepower and 330 lb-ft of torque and available with the optional turbo diesel 6.2 liter V8 (195 horsepower and 430 lb-ft of torque). Whomever on the show staff who made the order of the two burgundy Suburban wisely chose the standard 5.7 liter V8 and not the turbo diesel 6.2 liter V8. The diesel V8 would have been a bad choice since all the diesel clattering and black tailpipe smoke would have been a distraction for many TV viewers. The 2500 series Suburban was also standard with the 5.7 liter V8 and could be ordered with the optional turbo diesel 6.2 liter V8 however it could also be equipped with an optional 290 horsepower 410 lb-ft of torque 7.4 liter V8. Fortunately for Tony the 7.4 liter V8 wasn’t available in the 1500, who knows what type of trouble with the law the lead footed Tony could have gotten himself into with this powerhouse motor. And the Burgundy exterior color was subjectively the best color on the option list that year. There were two identical Burgundy 1999 Suburbans used in series both were ordered at the same time. Ironically both were upgraded for the second season with a large front grille guard and a set of (above the) front bumper mounted round off-road lights. Also added to the vehicle were black taillight guards and side window plastic rain deflectors. Both Suburbans were technically retired at the end of eason four since season five debuted with Tony driving a new black Cadillac Escalade which was more in-line with what a mob boss like Tony should be driving. However the story doesn’t end there. 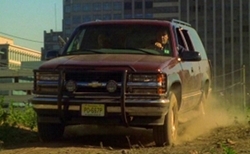 The burgundy Suburban returned in the middle of season five for a few scenes after Tony totaled his new Escalade. Viewers were never told where the Suburban had been hanging out, while Tony was making the rounds in his new Escalade. The return of the Suburban was short lived, Tony soon purchased a new white Escalade, and the Suburban was never seen again except in the opening credits. Nonetheless one of the two Suburbans driven by Tony can be yours. Just imagine you can drive with a cigar in your mouth around town with Alabama 3’s song "Woke Up This Morning" playing on the CD player. The Auto Collections of Las Vegas, Nevada currently has one of the the show’s two Suburbans for sale. As Auto Collections explains on their website, there are two identical lead character vehicles for most TV shows and movies – one is used primary for exterior shots and the other for interior shots. The one currently for sale was used primarily for interior shots. Ironically the one for sale is missing the side window plastic rain deflectors and the rear taillight guards. It’s not known if they were removed or if they were only installed on the other Suburban. Fortunately the front grille guard and off-road lights are there. 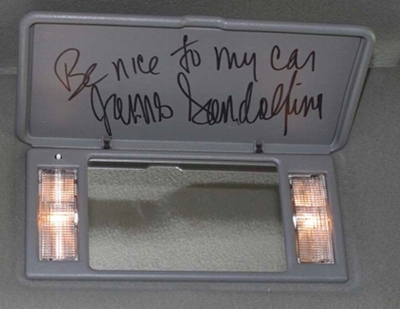 And as an added bonus there’s a special autographed message from the now departed James Gandolfini when you flip open the drivers’ side factory visor vanity mirror which jokingly states, "be nice to my car". Unfortunately it’s unknown what’s the asking price for this piece of TV history (you have to inquire about the price). As they always say, if you have to ask what the price is, you can’t afford it. This special Suburban is waiting for the right buyer who wants the ultimate TV collectable, to drop a small fortune for it. And the buyer will get much in return. This car a couple of years ago was documented as having around 53,000 miles and currently is still in excellent condition. And since this was the interior shot car, the cabin is also in pristine shape. And in case you don’t have the Soprano stacks of $100 bills the size of big bricks lying around, The Auto Collections also has numerous other The Sopranos TV show memorabilia for sale on its website including a confidential script of the last episode "Made in America" and even the Saint Elzear statue as seen in "The Ride" episode. Chevrolet has sold a large amount of Suburbans over the years. It’s a popular big utility vehicle that can haul around the entire family and heaps of cargo. It may look nice but the real reason why buyers keep coming back for more, is the Chevrolet Suburban delivers the ultimate in spaciousness and utility. Two important traits that probably led Tony to purchase the Suburban. He could have easily purchased something fancier but he decided on the Suburban instead. Same was true when it came to his choice of food, he never ran from a finely cooked steak however his favorite food was gabagool which is slang for capicola, a traditional Italian cold cut. Even though Tony had moved up the socio-economic ladder, living in a million dollar mansion during the entire duration of the show, he preferred a Chevrolet Suburban and gabagool. In the end what David Chase was trying to convey to the audience with the symbolism behind the use of the Suburban, was that behind the false facade of Tony’s money and prestige was a blue collar guy from North Jersey who needed reliable and attractive utilitarian transportation. With the Suburban that’s exactly what he got.